Common Sense is a pamphlet written by Thomas Paine in 1775–76 advocating independence from Great Britain to people in the Thirteen Colonies. 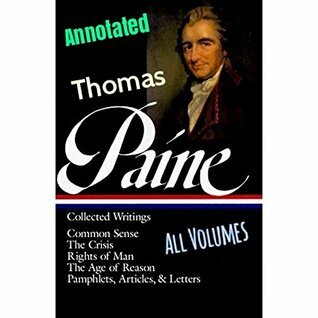 Written in clear and persuasive prose, Paine marshaled moral and political arguments to encourage common people in the Colonies to fight for egalitarian government. It was published anonymously on January 10, 1776, at the beginning of Common Sense is a pamphlet written by Thomas Paine in 1775–76 advocating independence from Great Britain to people in the Thirteen Colonies. Written in clear and persuasive prose, Paine marshaled moral and political arguments to encourage common people in the Colonies to fight for egalitarian government. It was published anonymously on January 10, 1776, at the beginning of the American Revolution, and became an immediate sensation. It was sold and distributed widely and read aloud at taverns and meeting places. In proportion to the population of the colonies at that time (2.5 million), it had the largest sale and circulation of any book published in American history. As of 2006, it remains the all-time best selling American title, and is still in print today. Common Sense made public a persuasive and impassioned case for independence, which before the pamphlet had not yet been given serious intellectual consideration. He connected independence with common dissenting Protestant beliefs as a means to present a distinctly American political identity, structuring Common Sense as if it were a sermon. Historian Gordon S. Wood described Common Sense as "the most incendiary and popular pamphlet of the entire revolutionary era".